A Day at the Beach with the Fam...AKA Hold onto your HAT! Melissa and Michael came down for the weekend to fish. Michael had bought a Groupon for a Bay Fishing trip on a boat out of Port Aransas that he took on Saturday, but we had nothing planned for Sunday and I was determined to get some sun. We all piled into the van and drove out to the National Seashore Park and Malaquite Visitor's Center for the day. It's really a nice park and most of the time there's nobody there. At least the times Bruce and I have driven out there, it's been relatively uncrowded. The winds today are probably keeping many people inside, but I've got to get out and soak up some rays. The boys helped us pack our gear out onto the beach so we could settle in to sunbathe. They all went out for about 3 seconds, then Bruce came back up on the beach and packed it in. He has no time for wasting and made himself comfortable on the beach watching Michael, the last hold out, trying to avoid being wrapped in seaweed and washed up on the beach like a turtle. We didn't catch any fish, but we had a nice family day at the beach. As Members of the Bay Yacht Club, Bruce and I, Brittney and Matt were all invited to this year's Annual Admiral's Community Reception. It has been going on for years and due to our Commodore being well connected, we at the Club received invitations. I would like to think it's because we're all so important and everyone wants to be our friend... but it's more like "Lisa got everyone who had a boat participate in a Navy Regatta an invitation". Brittney, Matt and I spent most of the day looking for an outfit to wear. The thing I had planned to wear was vetoed by my children and Matt needed a suit anyway... so we all had a excuse to get something new for going out on the town to a Garden Party at NAS. Unfortunately for us... the rest of the invitees didn't get the same memo as we did, or maybe "that's just Corpus Christi"... but many of the other people there were dressed way down. Oh well, we had fun dressing up and I would much rather be overdressed than underdressed. I've been there before and it's excruciating. The party was very nice. The winds were howling (of course), but the garden behind the Admiral's home where the tables were set up was well protected. There was a buffet of odd tidbits, all of which were very tasty. There were drink choices and lots of people milling about. We saw quite a few BYC members and a few from CCYC. We sat at a table with an 80 something year old Retired Military Gentleman who kept us mildly entertained. There was a little mishap when a rogue gust of breeze flipped a plate from the table onto this man's chest. We wiped the shrimp sauce off for him and made a hasty retreat. We spent some time chatting with Lisa and Terri then made our exit. It was all very low key and sedate. Would I go again if invited back next year? Probably not. But it was nice to go once anyway. 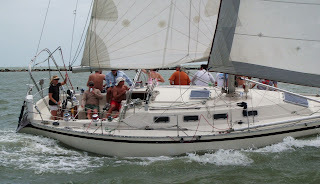 We had a full crew aboard Elan for this year's Port A Regatta. Some old friends and some new ones. Robert came out to play with us on Saturday, the first day of the Regatta. He sure knows how to pick 'em. The winds were howling and the Bay was the roughest we've ever sailed in with Elan. If it had been a cold day, it would have been completely miserable. Bruce had thought ahead and brought out all of our jackets and foulies for the crew. Good thing, too. Every bit of help in the water shedding department would be needed this day. We had Matt and Brett on foredeck. Clay has made it to the cockpit and only goes to foredeck when his considerable expertise is demanded. Today, he stayed back where it was (relatively) dry and watched as the new regime was dashed and tossed again and again as they tried to get the carbon blade hoisted. We had a bit of a twist in the sail and the whipping winds were making it worse. The halyard somehow got wrapped around a side stay. Bruce finally had to quit trying to direct from mid-ship and went forward to free the halyard. Once all the drama was over, the foredeck took a break and watched as the giant waves tossed us around like a cork. Brittney was forced to stop taking pictures so that she could hang on for dear life. I was at the helm during all of this and kept thinking that it might be a good time to make an Executive Decision to ditch this race, but Bruce was resistant and avoided eye contact until it was too late. He relieved me at the helm and took us quickly to the start line, where we arrived barely in time, but somehow in a pretty favorable position. We joined the other Skippers who all seemed in agreement, just get the boats over the line and avoid hitting one another. That's exactly what we did, and off we went on a very wet ride. Of course, once we got under way, the tossing eased somewhat. We knew (hoped) that the forecast drop in winds would find us before too long. Even if not, the wind direction promised that the chop would lessen as we neared the Ship Channel so we had hope. As I said, Brittney was forced to give up the camera. There would be no way to keep the salt water off the lens anyway, so there are no more pics of the first day. We bashed to weather across the bay, throwing spray everywhere. The ride became less violent as we neared marker 43 and the entrance to the promised calm of the Ship Channel. 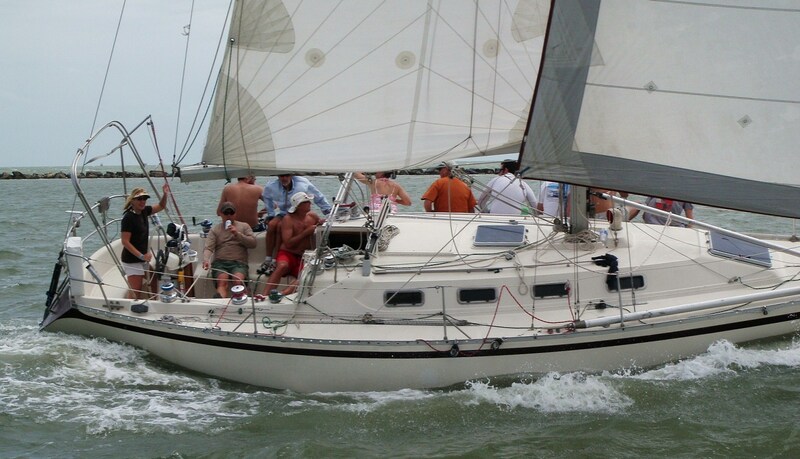 We exchanged the tossing of the waves for the ordeal of over 50 short tacks with the winds directly on our nose all the way to the finish line near the ferry landing in Port Aransas. We wore out all our men and had the added bonus of engine trouble in the end. Luckily, Bruce was able to get things lined out and we made our way to the bright sunshine and near calm of the Port A Marina, where we were joined by friends all happy to be done with this race. We enjoyed the party and dinner, then slunk off to our beds for an early night. Even our younger crew members were in by midnight so that they could be ready to spring into action for the Ladies Race on Sunday. The day dawned bright and beautiful. The Crew came back (a miracle) and we readied the boat for another day on the water. The winds were somewhat more reasonable and it would be a downwind course, so we weren't scared. Bruce made the decision to be conservative after the beating we had previously taken. I was thankful as it was just myself and Brittney aboard to helm the race. We jockeyed for position at the start line. Our Crew were in good spirits as this was already looking much better than the day before. Sunshine, decent winds, conservative sail area... What more could we ask for? Our crew consisted of some new faces, as mentioned before. We were happy to have another BYC member, Steve, the owner of an Endeavour 42 (a boat I would love to have) aboard for the Ladies Race. We also had a new sailor in our midst, Jim, who joined us both days and even entrusted us with his son for the second day. Both of them are welcome on board Elan again and Bruce is looking forward to teaching him a position as Crew. Brett brought along a guest both days, Kevin. We couldn't believe that his first time out sailing was such a crazy one, and this guy shows back up for another helping. Some people are just gluttons for punishment. We really enjoyed having his smiling face on board for this event. Next time, he's crew! Early into the race, we watched as our biggest competitor and fellow BYC member, Warrior, crept past us in a dual that ended with us diving upwind of them leaving them to drop to the other side of the Channel, where they inched inexorably ahead of us on the course. Lisa was their helms person for the day. The lone Warrior Woman, extraordinaire! My strategy was to take the Green side of the channel to avoid having other boats take our wind. Unfortunately, there was less wind to take with the shelter of the spoil islands. But, I was committed and had to make the best of it. We watched as the spinnaker fleet slowly came up behind us. My brother, Mark found us while out jogging on Saturday and was free to join us for the return trip to CC. We haven't seen much of him recently as he has been very busy earning his PhD. Priorities... right? Well we were glad to have him aboard and hope to see more of him in the coming months now that he's almost finished with school. The sail down the Channel was uneventful outside of the photo ops afforded us by the passing of the spinnaker fleet. I did ask for a bit of relief at the helm just prior to leaving the Ship Channel. Brittney took the helm and did very well. I forget that she's only really been sailing for a short time. She has a natural feel for it and I was proud sitting next to her eating chips while I listened to her working out what to do with the wheel when a gust tried rounding the boat up. A NATURAL! Once back in the Bay, it was a fast ride to home. The boat speed was in the 7+ knots range most of the way. I enjoyed surfing the waves and nothing went awry. We ended the day at the CCYC after party where the trophies were presented. We had only 6 boats in our fleet for the second day and we came in 4th. Two of the fleet from Saturday switched to All Sails and one boat dropped out. All in all, we were happy with our conservative choices and our Crew gained confidence, knowledge and experience. Thank you all for helping us race and we welcome you all back again!